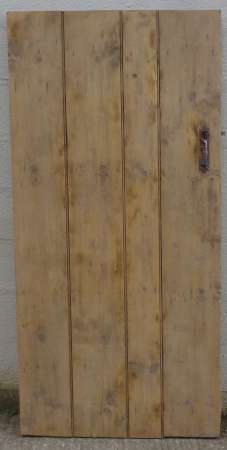 C19th beaded ledged pine door with latch set & hinges. 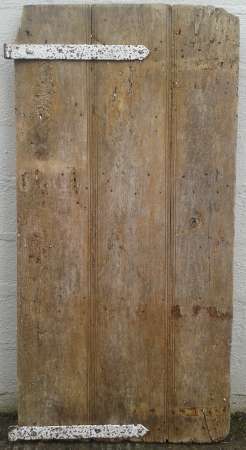 Early 19th century 4 plank ledged pine door. 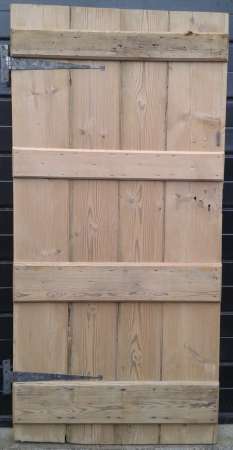 Very early studded pine door with original pintle hinges – NB. repair at foot of door. 1770mm in height x 775mm x 40mm. 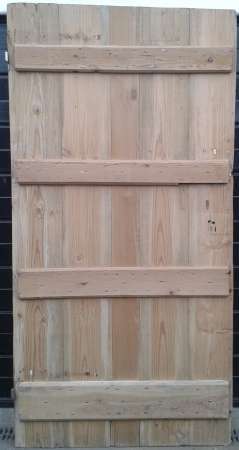 C19th beaded ledged pine door with latch set. 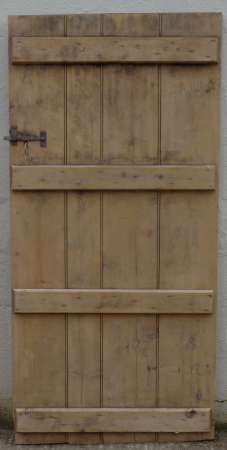 An early ledged oak door with original pintle hinges & thumb latch – a fantastic old door with 13″ wide planks. 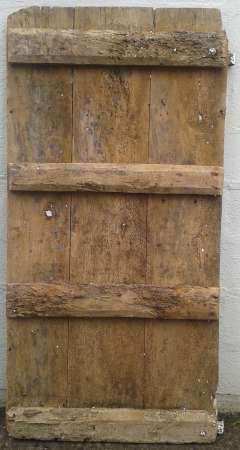 A nice tall early 19th century 3 plank ledged pine door with original T-hinges. 1967mm minimum height x 800mm. 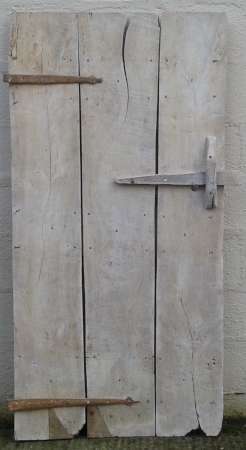 Early 19th century ledged chestnut door with original oak box lock and blacksmithmade thumb latch & hinges. 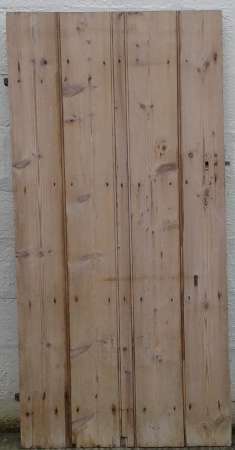 A large early Victorian ledged pine door. 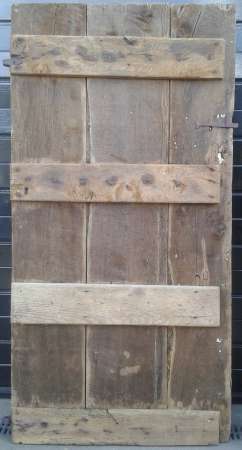 19th century ledged 3 plank pine door with original T-hinges & thumb latch. 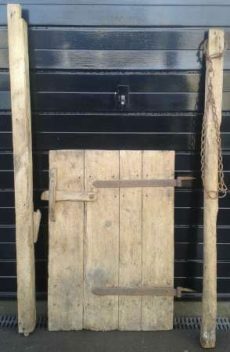 A 3 plank ledged pine door with original blacksmithmade thumb latch circa 1860. 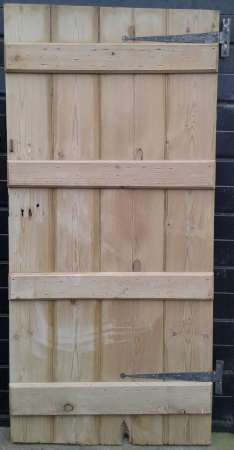 An early 3 plank ledged pine door. 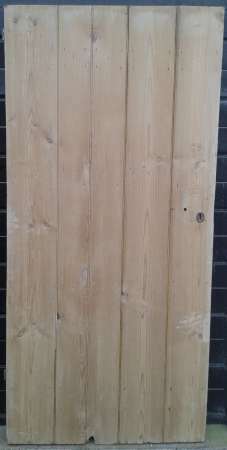 1795mm sloping to 1765mm in height x 755mm.
. 19th century wide plank ledged pine door. 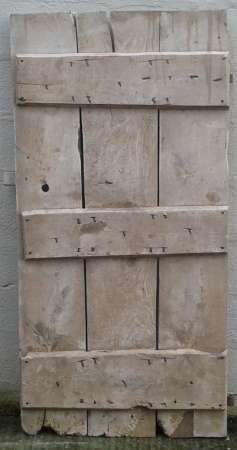 A 4 plank ledged pine door circa 1860 with original blacksmithmade thumb latch and T-hinges. 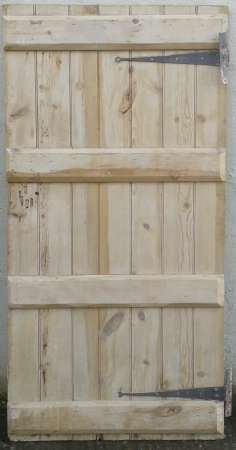 Tall Georgian 3 plank ledged pine door. 2175mm minimum height x 772mm. 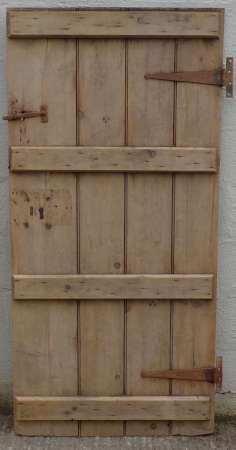 Early 19th century ledged oak door with original hinges. 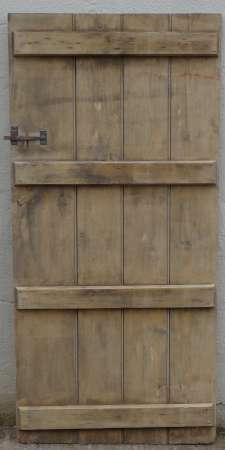 Georgian 5 plank elm door with original T-hinges. Stripped & in lovely condition. 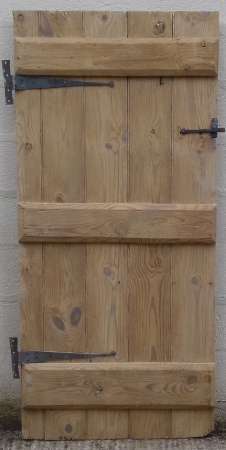 An early oak & pine ledged door. 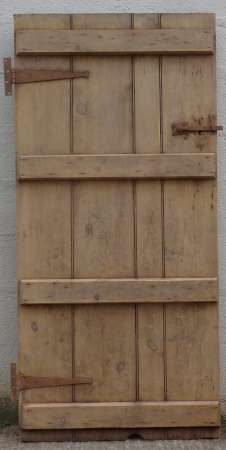 18th/19th century oak ledged door. 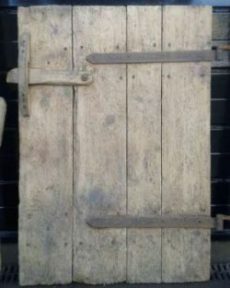 A large Georgian ledged oak door with original pintle hinges. 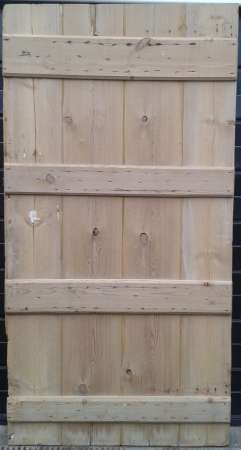 2 plank ledged pine door. 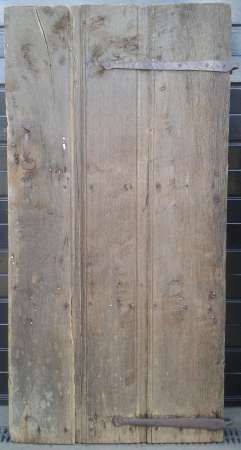 19th century 4 plank ledged pine door. 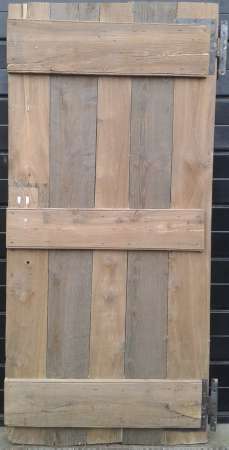 An early rustic wide plank ledged elm door with original oak latch & iron pintle hinges – 2 repairs to foot of door. 850mm minimum width x 1715mm sloping to 1685mm. 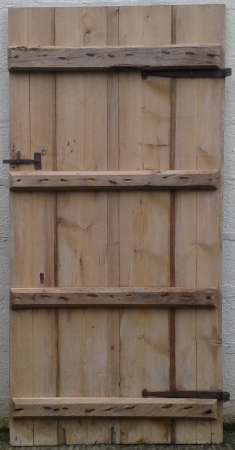 Early C19th beaded ledged pine door with elm ledges & original pintle hinges. 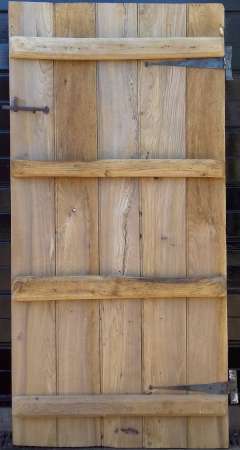 Rustic C19th ledged pine & poplar door with original T-hinges. 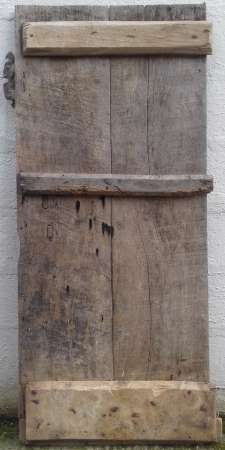 Circa 17th century ledged oak door with oak & elm ledges. 1530mm x 665mm minimum width. 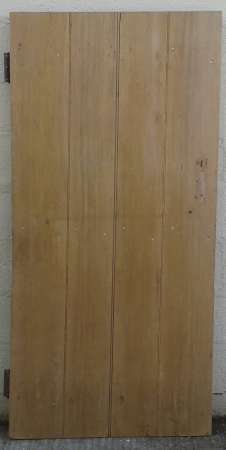 Early ledged oak cupboard door with original HL hinges. 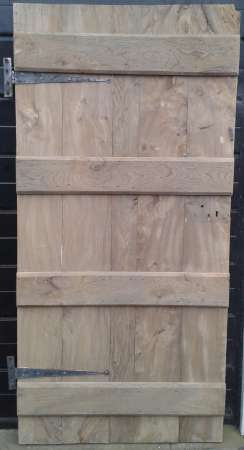 An early ledged elm door. 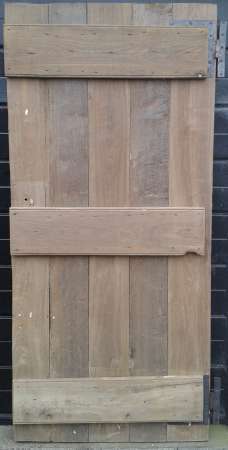 Antique ledged 4 plank English hardwood door (possibly fruit wood) with original handmade thumb latch & pintle hinges – has been extended in pine at top. 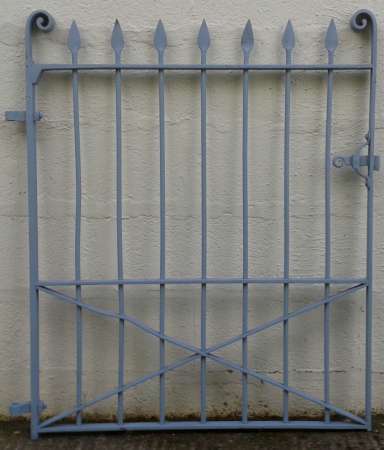 1772mm x 835mm (minimum width). 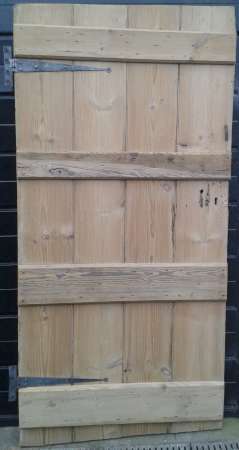 Wide victorian pine ledged door with original hinges. 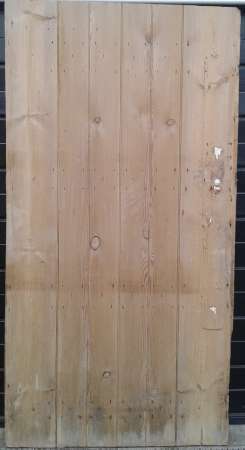 19th century 4 plank beaded pine ledged door with original latch. 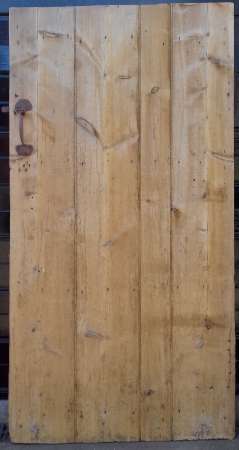 19th century 4 plank beaded pine ledged door with original latch handle. 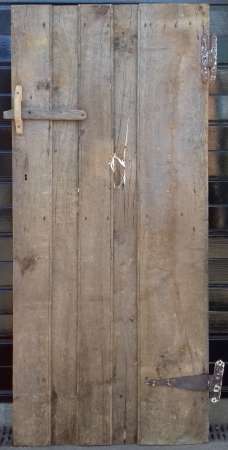 19th century ledged pine door with original latch & T- hinges. 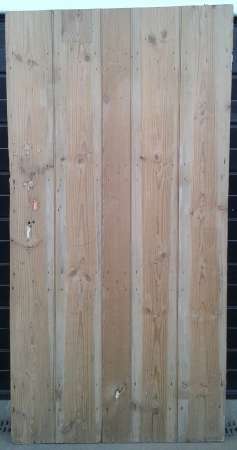 19th century 4 plank beaded pine ledged door with original latch set. 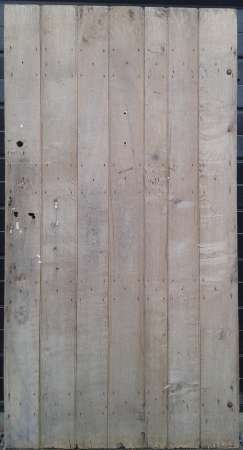 Lightweight – vertical boards are 15mm in thickness. 1710mm height x 755mm wide. 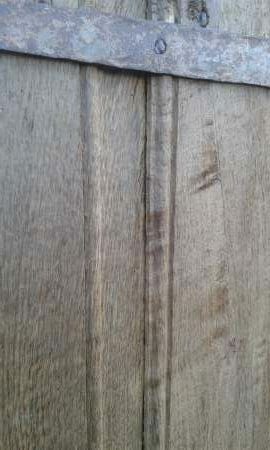 2 matching 18th /19th century ledged oak doors with original HL hinges. 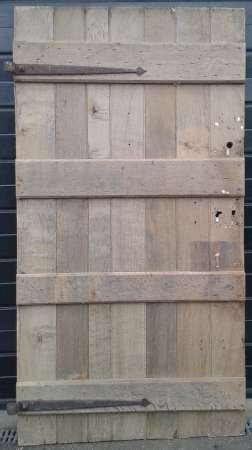 Stripped – very nice doors. 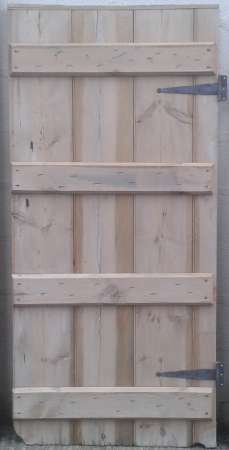 Georgian beaded 4 plank ledged pine door with original T-hinges. 885mm x 1810mm once squared up. 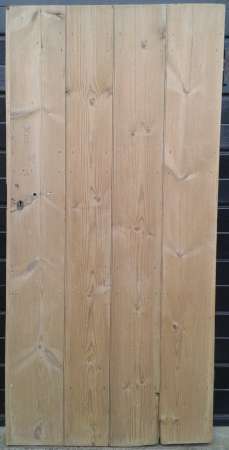 Georgian beaded 4 plank ledged pine door. 1010mm x 1955mm sloping to 1980mm. 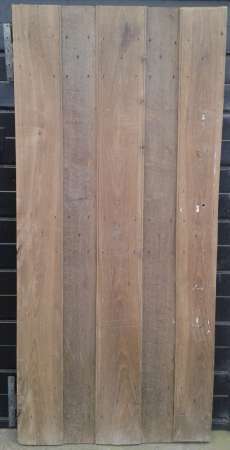 880mm x 1810mm once squared up. Stripped and in great condition. 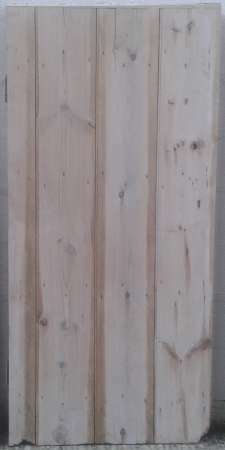 A large Georgian ledged pine door. 1015mm in width x 2000mm sloping to 2030mm. 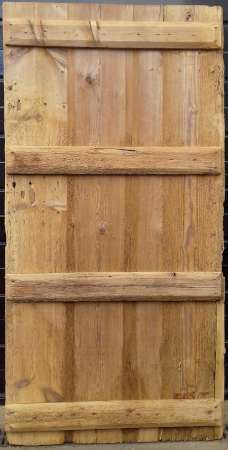 An early beaded 3 plank elm door. 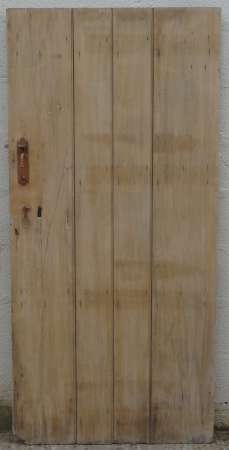 An early beaded 3 plank elm door with original thumb latch handle & oak box lock. NB. 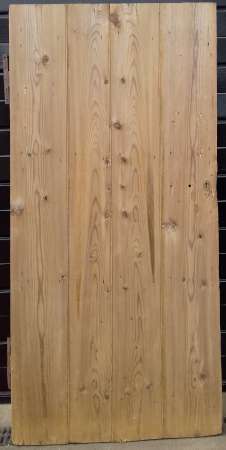 Pine plank added to base – size with this removed is 1737mm x 765mm. 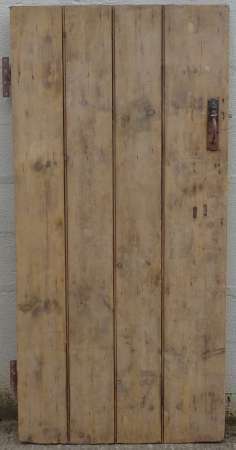 An early beaded 3 plank ledged elm door with original T-hinges. 1752mm (not inc. strip added to top) x 760mm. 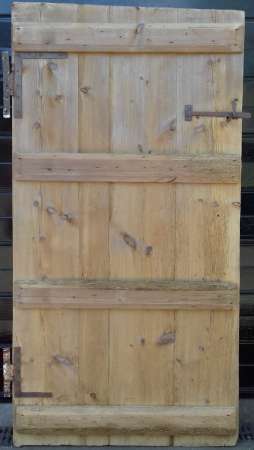 A 19th century pine stable door with original pintle hinges & hinge pins, oak latch, receiving post and animal tethering post with original chain. Rustic & full of character. 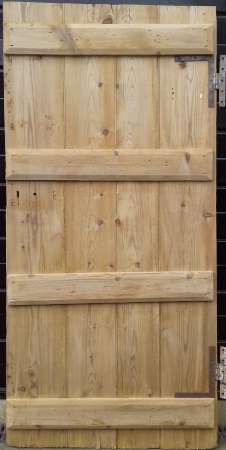 Door – 740mm in width x 1065mm in height. 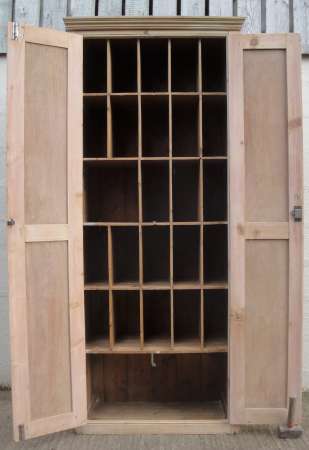 Receiving post – 115mm x 75mm x 1840mm max. length. 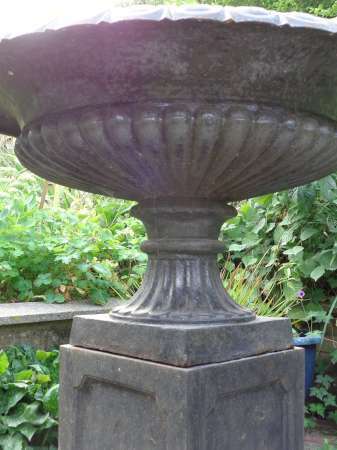 Tethering post – 78mm x 73mm x 1745mm max. length. 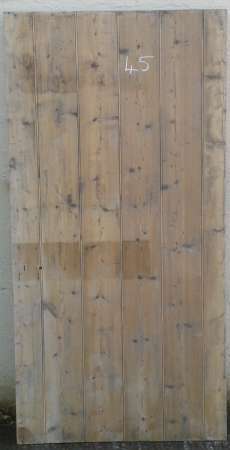 An early beaded 3 plank ledged elm door with original hinges. 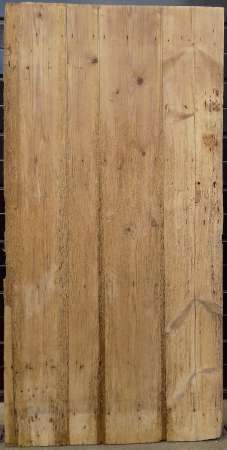 1712 – 1740mm x 788mm. 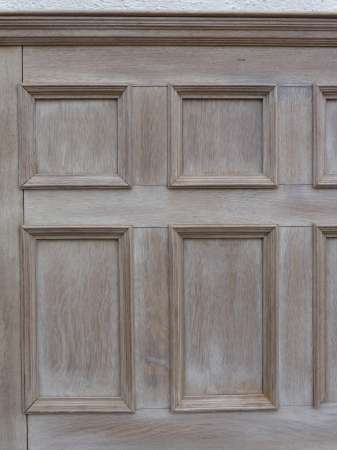 A beaded ledged English hardwood door with original T-hinges & latch. 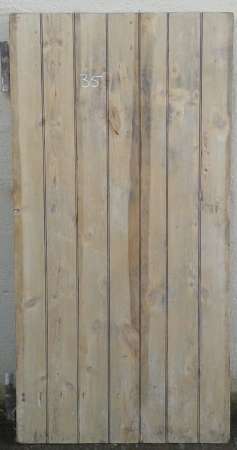 A beaded 4 plank ledged pine door with original T-hinges & latch(slight damage to latch but functional). 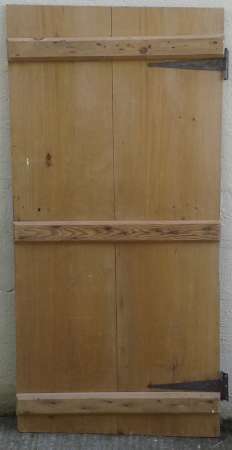 An early beaded 4 plank ledged pine door. 1754-1788mm in height x 848mm. 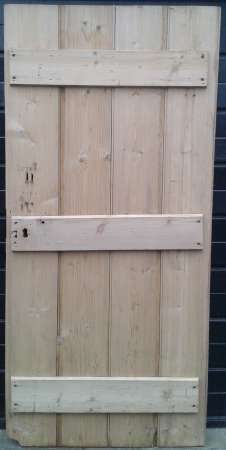 An early beaded 4 plank ledged pine door with original HL hinges & latch. 1760mm min. height x 800mm. 1760-1790mm in height x 915mm. 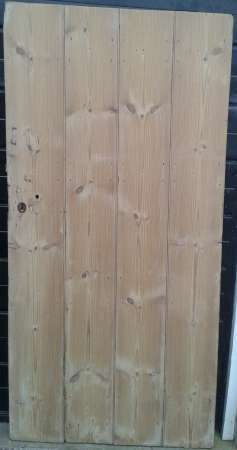 An early beaded 4 plank ledged pine door with original HL hinges. 1760mm min. height x 845mm. 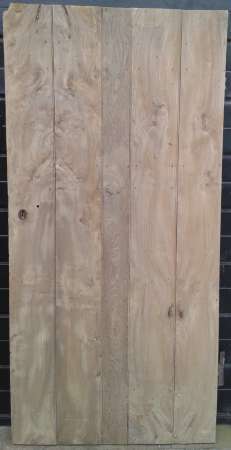 An early rustic 4 plank ledged pine door. 1800mm min. height x 900mm.